In my Amazon Reviewing Intro post, I promised I would give you examples of reviews I have written. When you opt in to product posts in the online groups or websites, doing extras like photos, video, or blog post generally increase your chances of being picked to review that product. I always add pictures, just to make my reviews more legitimate. This is especially important if you receive a product direct from the seller as opposed to ordering through Amazon with a promo code. The pictures and video prove that you did actually have the product to test out and are not just writing a review without testing it out first. Adding in videos and making blog posts take more time, so I generally only opt in to do these kinds of extras if it is a product I really want. The longer you have been a reviewer and the better your ranking gets, you can be more selective on what items you choose to review. Right now, I am trying to limit myself to no more than 6 products a week and prefer to not spend more than $2 on an item, but there are always exceptions based on what pops up for review on the sites. Last week, I opted in to do a blog post on 2 items because I thought they would be really useful and because I wanted to have examples to show you. The USB accent lights fit great around our 50 inch flat screen LCD TV. There are 2 strips of lights, one of which has a longer cord that will reach to the opposite side of the TV from where the control box and USB power cord are located. The USB cord is great because it doesn’t take up room on a power strip or wall outlet plug like other light sources. The adhesive backing of the lighting strips stick securely to the back of the TV and provides a nice even light. With the remote as your control, you can change the color and the effect of the lights easily. With all the options that these LED strip lights provide, you can choose a combination to set just the right ambiance. These lights were super easy to install, no tools or special electronics knowledge necessary. I really like that these USB accent lights provide some extra light that doesn’t cause a glare when watching TV at night. I received this product at a reduced cost in exchange for my honest an unbiased opinion. 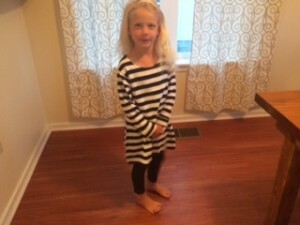 I ordered this girls stripped dress in a size 6-7 for my just turned 6 year old daughter who normally wears a size 6 clothes. The fit of this dress is very unproportionate. When first trying it on, the dress was very baggy and loose all around and was very short. I would not let my daughter wear it as a dress and it definitely needed leggings underneath, it was more of a tunic length. The sleeves were way too long and the neck hole very large causing it to hang on my daughter in an unflattering way. After washing in hot water and drying on hot, The “dress” shrunk and the sleeve length fit much better. The length of the dress also shrunk and is defiantly just a tunic, barely covering my daughter’s bottom. She likes to wear it with some sparkling or printed leggings though, so I am giving 2 stars. 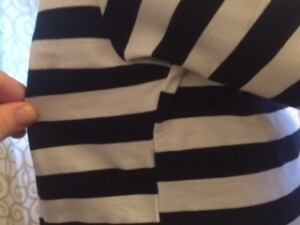 She does not to seem bothered that the stripes do not line up at the seams, which I find unappealing. The hems of this dress have a tendency to roll inside out, exposing the stitching around the neck, sleeves, and bottom hem. The fabric is made of a stretchy material and held up well to my daughter wearing it to school, playing at the playground after school, and rolling down a hill without being damaged or getting grass stains. Bottom line, this does not fit as a dress, but as a baggy tunic. I received this product for free in exchange for my honest and unbiased opinion. Just remember to ALWAYS put your disclaimer and to write an honest review for products ordered with promo codes. I was apprehensive at first to contact an admin about a product I found sub-par, but have not had a bad experience yet from doing so. Leaving truly honest reviews will establish you as a credible reviewer who isn’t viewed as someone doing it just for the free stuff. I started reviewing for the free and discounted products, but have since come to value honest reviews. When I need to purchase something off of Amazon, I want to trust the rating system and reviews of the products to make sure what I am ordering will fit my needs. I think it is our duty as reviewers to provide quality reviews whether we received a promo code or not. I hope these examples helped you understand what a well written review with different extras added in should look like. Now, I must go see what new opt ins are available! This entry was posted in Amazon Reviewer. Bookmark the permalink.